Jonathan Flores/Pipe Dream Photographer Senior attack Thomas McAndrew’s two late-game goals were not enough to erase UMass Lowell’s sizable lead as men’s lacrosse drops another one. Despite a late push, the Binghamton men’s lacrosse team lost to UMass Lowell 14-10 in its first America East (AE) match of the season. The match began with three unanswered goals from UMass Lowell (4-4, 1-0 AE) in the first seven minutes of the first quarter. The Bearcats (1-7, 0-1 AE) managed to find their way onto the scoreboard before the quarter’s end, however, scoring two goals. Just a few minutes into the second quarter, the River Hawks scored two goals to extend their advantage to three. 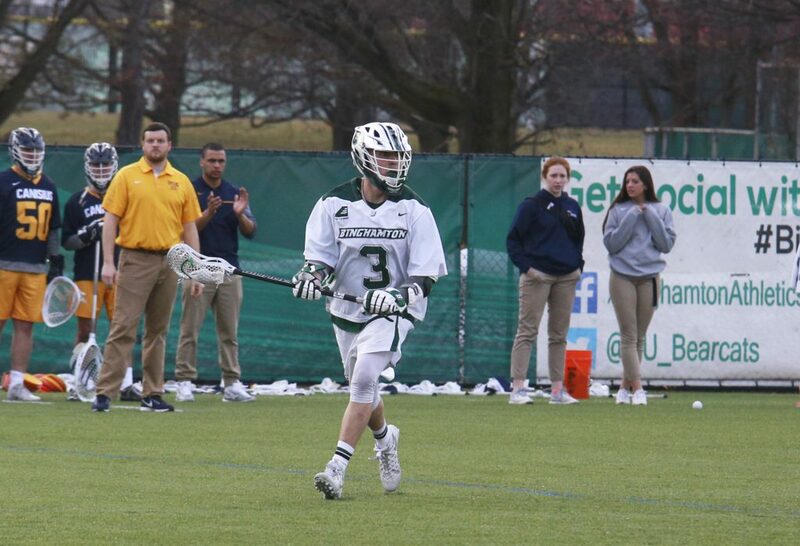 Binghamton won the following faceoff as junior long-stick midfielder Timothy Mattiace picked up the ground ball. After two missed attempts, freshman attack Sean Makar’s shot found the back of the net. A few minutes later, Makar continued to contribute to the team’s offense by assisting on freshman attack William Talbott-Shere’s fifth goal of the season. Several scoreless minutes later, the River Hawks broke the silence with two goals only over a minute apart to end the half. “You look at the amount of shots that we created … I think if we were able to finish them, some of that momentum might have gone in a different direction,” McKeown said. Coming back from the half, UMass Lowell recorded another score almost immediately. BU’s response from Talbott-Shere was soon to follow. With the score at 8-5, the Bearcats were doing their best to remain in the game. This became more difficult as the River Hawks scored two more goals before the third quarter concluded. It was during the beginning of quarter four that UMass Lowell’s edge began to reach seemingly insurmountable levels. The River Hawks scored two more goals within six minutes, bringing their lead to seven. Shortly after that, junior midfielder Joe Licata gave the Bearcats their first goal of the quarter. Not looking to lose their lead, UMass Lowell scored one in response. With five minutes on the clock, BU gave its best effort to take the lead, or to at the very least go down swinging. Licata began the onslaught by scoring another goal, which was followed by two from senior attack Thomas McAndrew and one from senior midfielder Joe Grossi. The River Hawks’ defense allowed only one more goal before the clock reached zero, though it was not enough to overcome the deficit. Redshirt sophomore goalie Kevin Carbone finished the day with 14 saves, and senior midfielder Austin Macchi won 11 of 17 faceoffs. The Bearcats are set to take on Vermont on Saturday. Faceoff is scheduled for noon from Virtue Field in Burlington, Vermont.